What is the Best Resume Format: Bullets or Paragraphs? 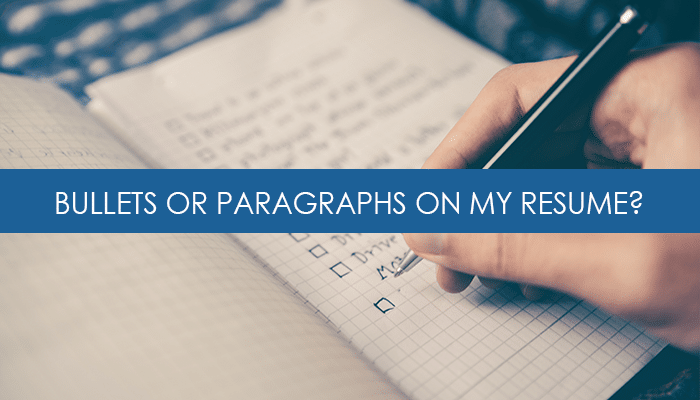 Q: Should I use bullet points or paragraphs when listing out job descriptions on the resume? You have roughly 7 seconds to establish a message and communicate your qualifications in a way that leaves a lasting and positive impression with hiring managers. This means that your content needs to be easy to scan and read through fairly quickly because you risk losing their attention in mounds upon mounds of verbiage. The thing to be aware of is that in this “bullets versus paragraphs debate”, there’s potential to go wrong in either scenario. If your information is ineffectively displayed in a lengthy list of bullet points, an overly-wordy paragraph, or any other format that doesn’t lend itself well to scanning through, your message will be lost and your audience will miss pertinent information that qualifies you for the role. If you can condense the description into a 3-4 line paragraph, then do so. When using a bulleted list, try to keep it between 4-8 bullet points, with each point ideally taking up no more than 1-2 lines. My preference is actually to combine the two, when possible. Start off the description with a brief 1-2 line high-level summary of the role, followed by supporting bullet points around your specific responsibilities, contributions, and accomplishments. You may even decide to separate out your accomplishments into their own section beneath your responsibilities, and label it something like “Key Accomplishments” or “Select Highlights”. Each resume is different and its content unique, and as such, your strategy will depend upon what type of layout you need to effectively get your message across without losing your audience’s attention. You can have beautiful, expert written content that sings your praises and speaks perfectly to the job description, but if it isn’t easy to digest, it’s not going to be any more effective than a poorly written resume. This also includes the overall visual design and strategic usage of formatting elements. Tags: career, communication, job search, personal branding, professionalism, resumes. Bookmark the permalink.